We welcome and invite you to come worship with us, to experience the love of God with God's family. Our mission is to Rescue, to Encourage, to Empower, to Embrace, to Comfort, and to Lead. 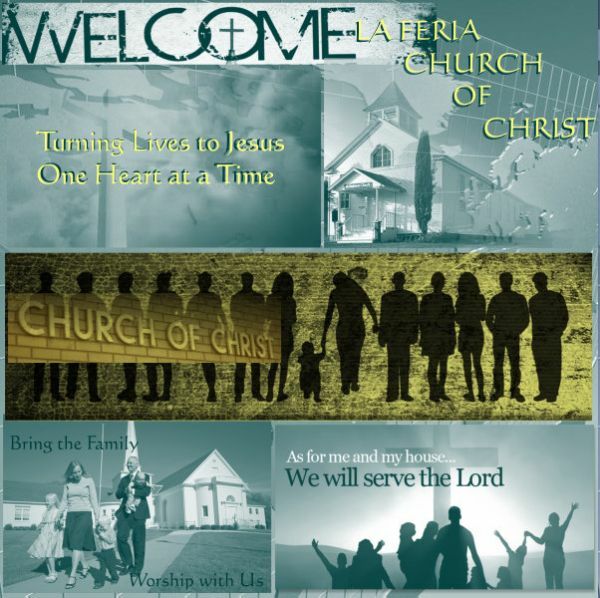 The church of Christ in La Feria is a non-incorporated independent church. We are God's children joyously involved in God's purpose as our mission is to GO: We move outside comfort parameters: reach out with the message of hope and Acceptance for Jesus Christ. We CONNECT: We touch lives with the love of Jesus Christ. GROW: We focus on Discipleship: belonging, maturing, understanding God's will through His Word. We SERVE: By developing personal ministry to serve and spiritually empower each other through fellowship, prayer, and encouragement. And we PRAISE: By Drawing close to God in unified worship and praise when we gather and worship together. Exit from Exp 83 at the La Feria - Hwy 506 exit; from 506 go east one block on frontage Rd, turn right onto North Parker Rd, Church Building 1/2 block on left.